EUROBRICO professional visitors can see more than fifty major innovations selected by the exhibitors of the event in the EUROBRICO gateway, located in the Pavilion 4 Feria Valencia. 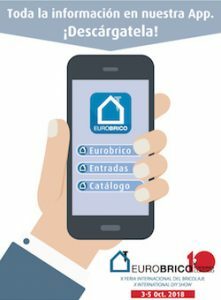 The selected products include all the sectors represented in EUROBRICO news, as painting, Tools, gardening, furniture, home or electricity. Like this, the references that will be showcased on the catwalk include news as the Transfer Marker Direct of bow tie, the felt-tip pen to transfer all kinds of printed images in seconds to all types of surfaces; the top BlackBerry Aroma of Wenko, an innovative cover with fragrance cartridge, Lotus or lemon, that can be seen when using the toilet; aguantaimanes de Novasol Spray paint; blades of wood cooking Wood Wraps de Lenas Legua; or of Astigarraga pine solid wood multifunctional module, It allows to create multiple compositions from a single kit. Among all the submitted products, a jury composed of important actors in the distribution will choose the EUROBRICO Awards 2018 you will appreciate concepts such as innovation, the utility for the professional or bricolador, the packaging, social responsibility or sustainability in the manufacture of products. These awards will be the day 5 October in the EUROBRICO FORUM space (level 3, Pavilion 2) to the 13 hours.